WHEN IT COMES TO SONG AND ALBUM TITLES, Chris Cornell knows a thing or two about getting it right. Having given the title Euphoria Mourning to his first solo album in 1999 on Interscope / A&M / Geffen Records, he was persuaded not to go with it and instead he reluctantly settled on Euphoria Morning. That was sixteen years ago; and a lot can happen in sixteen years. Universal Music Group has now happily corrected that perceived and admitted misjudgement and as Euphoria Mourning Chris's album will be pressed on 180gram vinyl and will include a download card featuring 320kbps MP4 audio ripped directly from the vinyl. The way Chris sees it is: "The title of the record has been restored to its original spelling, which was changed before release after I listened to some bad advice." A collaboration with Alain Johannes and Natasha Shneider (Natasha sadly died of cancer in 2008) of the band Eleven  who are featured on the album, co-wrote five of the tracks and were credited as co-producers, engineers and mixers with Chris Cornell  the album formerly known as Euphoria Morning was Chris's first solo release, having already established himself as the lead singer with Soundgarden. Understandably nominated for Best Male Rock Vocal Performance at the 2000 Grammy Awards, the album's first single Can't Change Me is a melodic, interesting track that peaked at number 5 on the Billboard Mainstream Rock Tracks chart and number 7 on the Modern Rock Tracks Tally. It has a similar noteworthy arrangement to Flutter Girl, reportedly an outtake from Soundgarden's 1994 album Superunknown. During a 2007 solo tour, Chris revealed that Wave Goodbye was written as a tribute to young American singer-songwriter and guitarist Jeff Buckley, who tragically drowned in Memphis in 1997 aged 30 in a freak accident. [Jeff's father Tim was also a singer-songwriter who, at the age of 28, died of a drug overdose in Los Angeles in 1975.] Wave Goodbye is a fitting tribute to Jeff. Preaching The End Of The World is an enjoyable ballad-style track and Follow My Way has a lovely undulating sound; a more unusual approach. We also like Mission and Sweet Euphoria, which is a fine track that suits Chris's voice. Euphoria Mourning is a compilation of flowing musical concepts designed to give Chris Cornell free rein to showcase his vocal talents. With four solo studio albums under his belt  including the 2007 Carry On, produced by Steve Lillywhite, 2009 Timbaland-produced Scream and 2011 live acoustic Songbook (Higher Scream, the fourth, is due in September)  Chris has continued to redefine his sound and vision to encompass new music, new collaborations and new activities. Indeed, Chris has a lot to be proud of. Not just of Euphoria Mourning but he was the first American male artiste to write and perform the theme song for a James Bond movie, Casino Royale's You Know My Name; he wrote and performed with Soundgarden the end credit song for The Avengers, Live to Rise; and wrote Misery Chain, performed with Joy Williams, for the Oscar-winning movie 12 Year A Slave. Chris's performance of his song The Keeper, which appeared in the Marc Forster-directed Machine Gun Preacher, earned him a Golden Globe nomination and this became the springboard to help raise awareness and funds for Sam Childers' Angels Of East Africa children's charity. Chris Cornell and his wife Vicky created the Chris and Vicky Cornell Foundation in 2012. The Foundation is at the forefront of the fight to protect the most vulnerable children, developing projects and programmes working with leading charitable organisations and partners to raise awareness and mobilise support for children facing tough challenges, including homelessness, poverty, abuse and neglect. 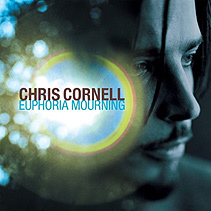  Grammy-winning, Golden Globe-nominated singer/songwriter and rock icon Chris Cornell has finally seen his original work remastered, re-released digitally and on CD on August 14, 2015, and on vinyl for the first time on September 25, 2015, with his desired title, Euphoria Mourning. Euphoria Mourning Tracklisting: 1 Can't Change Me | 2 Flutter Girl | 3 Preaching The End Of The World | 4 Follow My Way | 5 When I'm Down | 6 Mission | 7 Wave Goodbye | 8 Moonchild | 9 Sweet Euphoria | 10 Disappearing One | 11 Pillow Of Your Bones | 12 Steel Rain.